Carolina Crown took top honors (1st, 76.90) Friday, June 29 in Muncie, Ind., surpassing the Madison Scouts (2nd, 72.80) by 4.1 points and The Cavaliers (3rd, 71.70) by 5.2 points at Drum Corps International's DCI Central Indiana event. 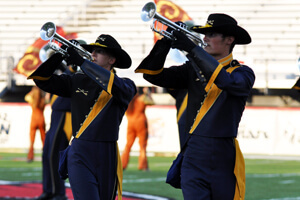 Crown's seventh straight victory on the 2012 DCI Tour, tonight's results also marked the first time in more than a decade that the Madison Scouts bested their Midwestern brethren, The Cavaliers. The last time the Scouts put up a higher score than the Green Machine was July 5, 1998 in Michigan City, Ind. Though they're happy with their victory at Ball State University's Scheumann Stadium, Carolina Crown drum major Mike Roche said that there's still a long road ahead of his corps. "We know it's still anyone's game," Roche said about the 2012 season. "We're thrilled to be where we are. We're just going to continue to perform and hopefully come out on top. We're really excited about how we're doing, but we have a long way to go." Crown has been in Muncie since Wednesday, taking part in the Music for All Summer Symposium, a week-long camp for high school musicians. Roche said there has been plenty of interaction between the corps and the campers. "They know us," he said. "They love us. We love them. They're great students, and they come from some of the best marching band programs in the country. We get to inspire them. And they help teach us a few things too. It's been a great experience." Though the group was unable to rehearse their joint finale performance of "Fanfare for the Common Man" due to an unexpected rain storm a few hours before the show was scheduled to begin, the high schoolers and Carolina Crown still pulled off an impressive performance for an enthusiastic crowd at the end of the night. "We were prepared for pretty much anything," Roche said about the weather. "Yesterday topped out at about 106 degrees. Today was a little bit cooler. It was good news for us. We made it through." Despite the high temperatures in Indiana, it wasn't just the heat corps and fans had to deal with. Rain was a common theme at this week's Indiana competitions, with Thursday's show in Merrillville, Ind. rained out. "It rained for two hours," Spirit of Atlanta color guard member Brittany Mastromatteo recalled. "But we continued to warm up as if there was still a show. We ended up having an amazing rehearsal, and we were really bummed that we didn't have a show." Despite yesterday's setback, Mastromatteo said Friday evening's performance in Muncie went great. Spirit's score of 69.80 (4th) was the same they earned three days ago in Mankato, Minn., placing them out of reach of the Blue Stars (5th, 67.50).